I'm so excited to have Kristy from ForeverSparkly do a guest post today. Direct Sales is an amazing way to make money from home and these days you can even do it all online from the comfort of your couch! No longer do you need to get on the home party bandwagon you can hold your parties online through Facebook. Kristy has put together her top 5 tips on how you can rock an Origami Owl Facebook party. Once you've read the post you should head on over to her blog and check out her other great posts as well! 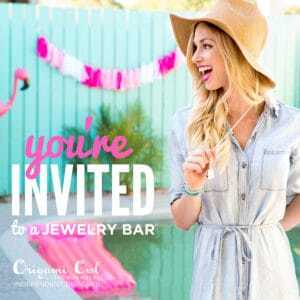 You've got your start-up kit, you've had an awesome Origami Owl launch party, now you have friends clamoring to host their own Origami Owl online parties! Eeeek! Don't panic or feel overwhelmed, I'll give you my 5 secrets on how to rock an Origami Owl online Facebook party to boost sales and hostess rewards! Read on, take notes, and let's get partying! Secret #1 – Success begins and ends with your hostess. As an Origami Owl Independent Designer, you'll want to make sure your hostess is on board with having an online Origami Owl Facebook party and is excited to participate! Answer any questions your hostess has and go over the hostess rewards with her. The more excited your hostess is, the more her guests will be excited and have fun interacting at the party! With Facebook parties, the temptation for your hostess is to invite everyone and anyone! Stop! Don't do it! For one, friends and family do not like being a part of a mass invite and Facebook does not like this either. Do not have your hostess land in Facebook jail! Coach your hostess to send a personal message to those friends and family members who would enjoy attending an Origami Owl Facebook party. Have invites sent to those who are truly interested and you'll end up with an exclusive invite list filled with guests excited for a fun party! The timing of an Origami Owl Facebook party is VERY important. The day, time, and length of an Origami Owl Facebook party can affect the amount of people who show up and interact which directly affects your sales potential. You want to set up yourself for success and once you have the right date and time, you are half way there! A party without music, games, and excitement is not a party right?! My best tip for hosting a rockin' Origami Owl online Facebook party is to think about a theme. A Facebook party theme will jump start you into coming up with the kinds of music, games, and interactive questions you want to ask throughout your party. Keep it fun and entertaining, and your guests will have a great time learning about Origami Owl and our gorgeous jewelry! Everyone loves a special offer or an exclusive deal! When it comes to an Origami Owl online Facebook party, you'll definitely want to offer something special to the guests who showed up and participated. I find a free gift with purchase or small discount off of purchases within a certain time frame help to seal the deal! Along with my 5 tips, I highly recommend checking out Brenda Ster's Epic Facebook Party Training. Her videos, workbook, and Facebook Party Outline is so easy to follow and recreate so you can rock your own Origami Owl Facebook Party! With these 5 secrets and Brenda Ster's Epic Facebook Party Training, your Origami Owl online Facebook parties will wrap up with increased sales and hostess satisfaction! If you would like to chat more about how to have an awesome Facebook Party, send me a message! I look forward to hearing from you!